Wolf Gold is a 96% RTP slot game by Pragmatic Play with features including Money Respin with 6 or more moon symbols and Epic Symbol Free Spins round. Grab a piece of the wild action Pragmatic Play’s top online slot from as little as 25p per spin on the 5 reel slot offering an impressive mega jackpot! Play Wolf Gold on Money Reels today which is home to over 550+ slot games. Our other top games include Rainbow Riches, Bonanza, and Chilli Heat! You’d be forgiven that with a title such as Wolf Gold, the online slot would just be an ode to one majestic creature of the wild, but nope. Wolf Gold celebrates the majesty of an array of wild animals which are found in the wild throughout the American West. You can expect to see the animals popping up as symbols on the reels, each of the animals will give you a different coin reward, even though we all know all too well that each animal is created equal in nature. The 5 x 3 reel slot offers 25 different ways to win in the main gameplay. Yet, is with the bonus rounds when things really start to get exciting! 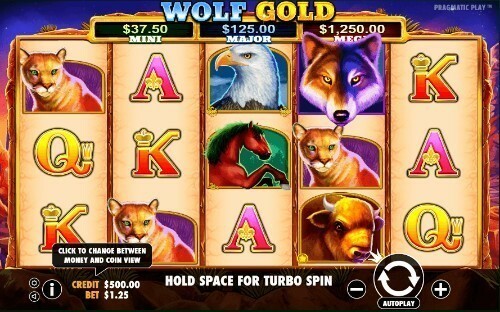 The bonus rounds in Wolf Gold have the ability to give out unlimited free spins. Yep, you read that right, we said UNLIMITED FREE SPINS! We will cover the bonus features to Wolf Gold in a little more detail down below, first we will explain all of the high-octane action which you can expect with the main gameplay which can lead you into winning one of three progressive jackpots. It isn’t rare for Pragmatic Play to offer more than one jackpot in their online slots, although, they have never quite been this generous with their jackpot amounts before! With Wolf Gold you can place a bet from as little as 25p, or as high as £125 per spin. So, this slot would be ideal for anyone looking to play with a mid-range betting size. For anyone looking for a slot which allows smaller stake amounts, we’d suggest playing Fluffy Favourites which is also available to play on Money Reels from as little as 1p per spin! If you have played Pragmatic Play’s games before, you’ll realise that they never tend to move far away from the classic slot machine set up, they see little reason to complicate matters when everyone still has a lot of love for the classic set ups offered by land-based slot machines. The Wolf Gold online slot is set to the background of an arid desert canyon, you’ll see rocks on the floor with desert fauna somehow popping up out of the midst of the barren lands. Yet, Wolf Gold also comes with a bit of a chill, as the sun is setting in the sky. It certainly gives you a lot of respect for the animals which live out in the landscape of America’s merciless west. On the reels, you will see some standard symbols which carry lower values following the typical formation of A, K, Q, and J. To spice up the main gameplay, you will also see the wild animals who are the highest playing symbols. The stallions will give you 8x your original stake amount. The bald eagles will give you 16x your original stake amount. The standard symbol which you will soon come to depend on to give you the tidy regards is the buffalo. Landing five buffalos on the reels will reward you with 20x your original stake. If that wasn’t generous enough, there is also the wild symbols, scatter symbols, and special ‘money symbols’ which you may not have seen in an online slot before. So this mixes up the game play for many online slot fans, who knows, it may have even lead to Wolf Gold picking up a prize as one of the best slots! Now, the visuals with Wolf Gold aren’t that striking when put in comparison to online slots featuring 3D symbols and flashy animations, but there is no denying that the slot is nicely done! The music works well with the visuals that Pragmatic Play cooked up, in fact, there is probably no faster way to be transported to the American Mid-West, unless you’re already there of course, then you’ll simply get to appreciate how authentic the online slot game is! Alongside the subduing and relaxing music which accompanies Wolf Gold, you’ll also hear the sound of the wolves howling in the background – or maybe they are simply there to cheer you on? In terms of game play, it doesn’t get much simpler, even with the addition of the money symbols and free spins rounds. While some people think the free spins round is a hit or miss affair, its plain to see that many more people favour Wolf Gold due to them. It’s all a case of whether luck is on your side whether the giant symbols will fall. If you’re up for a no-frills slot with a progressive jackpot, you can’t really go far wrong with Wolf Gold which was first released on April 12th, 2017. Even though there are many more aesthetically pleasing slots which have been released since 2017, Wolf Gold is still the 10th most played online slot game for a reason! The desert fox acts as the game’s wild symbol which can find itself anywhere on the reels to give you a helping hand when it comes to striking a winning combo, as it will replace all other symbols other than the scatter symbol. For the scatter to work, it will need to land on reel 1, 3, or 5, when you’re lucky enough to see the scatter symbol to land on all three of those reels, you’ll be automatically entered into the free spins round! You will only initially get six free spins, which might not sound all too impressive, but as we said before, the free spins are unlimited! In this round, if you are lucky you will see the reels come alive with giant symbols which will take up the entirety of reels two, three and four. If you land another scatter at this point, you will get three more free spins. This happens a lot more frequently than you’d think! There is absolutely no limit to how many spins you can enjoy for free! Another great feature in Wolf Fold is the Money Symbol – you won’t see these all too often in online slot games, but don’t worry, the rules are easy enough to follow! The Money symbol in Wolf Gold is the full moon (probably the reason why the wolves won’t stop howling in the background). If you land six Money symbols on one spin, you will trigger the Money Re-spin bonus round. Upon entering this game you will see all of the standard symbols removed, and you’ll only see the moons on the reels, each moon will have a different coin value. When the reels look like this, you will then get three re-spins, if on any of these re-spins you land another moon it will automatically join the existing cluster of moons, then your re-spin count will be re-set to three. As with the free spins, the amount of re-spins you can get is infinite! The round will go on, until you either run out of re-spins or you have filled the reels full of moons. If you are lucky enough to fill all of the 15 spaces on the reels with moons, you’ll win the mega jackpot of up to 625,000 coins! There certainly aren’t many online slots which offer such a high jackpot amount as Wolf Gold, but, if you still feel that Wolf Gold isn’t for you, we’ve covered some of the best alternatives from Pragmatic Play along with other game developers! Yet, with a return to player rate of 96.01% there’s almost nothing to lose from the legendary slot. Although Pragmatic Play have a portfolio of over 80 online slots, none have quite hit the mark as well as Wolf Gold. Wolf Gold was the game which put Pragmatic Play on the map. Even though Money Reels have been keen to feature their stunning in-house content since they first appeared in on the market in 2015. What started as a small collective of talent based in Pragmatic Play’s HQ in Malta grew into a powerhouse of talent with the capability to produce anywhere up to two new games each month! Given the size of their portfolio, as you’d expect their games have touched upon a great variety of themes. Yet, through browsing their portfolio, you’ll soon see that the Pragmatic Play team have a lot of fun digging down to the roots of various cultures and geographical locations for the ideas of their online slots. Whether you want to visit America, the Jungle, China, or Ireland, there’s a good chance that Pragmatic Play already have the online slot to take you there. With the size of the jackpots, you can probably afford to take yourself to your dream destination given the size of the jackpot amounts! Even though Pragmatic Play’s online slots are infinitely popular in the UK, they have also managed to pique the interest of slot fans all across the globe. Their online slots now come in 26 languages and is available in over 78 different countries – that’s 13 different jurisdictions which Pragmatic Play have won over with their addictive games! Along with the award-winning online slots which Pragmatic Play put out, they also feature on online casinos with their digital scratch cards, internet bingo games and other live casino games. But wherever you see Pragmatic Play’s name pop up on a game, you can be sure that you’ll experience nothing but 21st century standard gaming made through the most innovative tech, and the leading talent in the industry. Whichever game you choose to play, you will be able to rest assured that it has been fully optimised for mobile play – many players on Money Reels have been delighted at how the games squeeze down onto a four inch screen with no compromise to the gameplay experience or graphics. Wolf Gold may currently be the most popular online slot from Pragmatic Play, but you are sure to have seen their other titles feature on the top games on Money Reels. Their most popular games currently include Leprechaun Song, Chilli Heat, Great Rhino, Da Vinci’s Treasure, 3 Genie Wishes and Gold Rush. But none have picked up quite as much attention as Wolf Gold! Hot Safari may switch it up with the locations, this time, you’ll be in Africa surrounded by the deadly predators which roam with the planes of Africa. The 5 x 3 reel online slot also offers exciting unlimited free spins rounds, 15 different pay lines and an immersive and authentic tribal soundtrack, just as with Wolf Gold, there are plenty of high value symbols and the wild symbol which can win you up to 10,000x your original stake amount if you’re lucky enough to land five wilds on an active pay line. There may only be 15 pay lines, but the features In Hot Safari definitely make up for the lack of ways to win. With a return to player rate of 96.16% you’re sure to make the most of your money with this online slot! Okay, Jurassic Giants may be switching up the theme from the American Mid West, but Jurassic Giants is still an incredible game by Pragmatic Play! The fact that there are 4096 ways to win with this 4 x 6 reel slot left us with no question when it came to including the slot on this list. The return to player rate is the same as you will see with Wolf Gold, and you won’t be able to get the unlimited free spins which you saw with Wolf Gold, however, the fixed amount of 250 free spins which are up for grabs is infinitely easier to trigger on this medium variance slot game! Another great bonus of playing Jurassic Giants is witnessing how much effort Pragmatic Play put into the animations and graphics of the game which make Wolf Gold positively cut and dry in comparison. You’ll get to witness the most ferocious creatures which roamed the planet going head to head in one of the best visual bonus features you’ve ever witnessed. You’ll also be able to snag yourself a tidy 5x multiplier when this happens too! There are definitely no shortages when it comes to animal themed or spiritually themed slots from other providers either. So, if none of Pragmatic Play’s online slots quite did it for you, here are the best alternatives. If the characters in Wolf Gold weren’t cute enough for you, prepare to meet some of the cuddliest wolves you have ever seen in the 5 x 3 reel slot by NetEnt, there really is no over exaggerating just how adorably charismatic the creatures you will find on the reels are. With 20 different bet ways, the chance to cash out with a 400,000 coin jackpot and a tidy return to player rate of 96.34% there are also plenty more reasons why you should try out the slot and meet the quirky characters who will take no time at all to fall in love with. Maybe a small amount of that will be due to the fact that they can win you a considerable amount of cash! When it comes to spiritual slots, there aren’t many with the ability to rival Shaman’s dream which has retained popularity ever since its publication back in 2016, there have been literally hundreds of games published since. But what Eyecon created with Shaman’s dream was an absolute classic. Even though the stats don’t seem all too impressive with a return to player rate of 95.4%, jackpot amount of 4750 coins and 25 bet ways, there are plenty of reasons why thousands of players log into online casinos every day to play Shaman’s Dream. Along with your chance to connect with nature, you will also be able to enjoy the smorgasbord of free spins, gamble features, scatter symbols and wilds. Whether you choose to play on your handheld device or a full screen, there’s no disputing the fact that Wolf Gold is visually spectacular. Yet, here is just something about the way the screen will light up and enable you to bask in the stunning landscape which Pragmatic Play have created to allow reel spinners to really enjoy their gaming experience! There are absolutely no complaints when it comes to the mobile version which you will be able to log into through the Money Reels website. If the reels appear too small for you to work with in portrait mode, you can always play in landscape mode where the items on the screen may feel a little clustered. Either way, you can try Wolf Gold out for yourselves in a free demo version before you decide to spin the reels on your mobile or your desktop or laptop. Although, if you’re playing with your cat or dog in the room it is likely that they won’t ignore the howling of the wolves or the screeching of the eagles which make up the soundtrack to Wolf Gold! There was quite the media storm when Pragmatic Play released Wolf Gold! In the short amount of time that Pragmatic Play has been operating, they’ve made quite the names for themselves for their habit in putting out exceptional online slots. In 2018 Ventsmagazine.com voted Wolf Gold one of the best spiritual themed slots there is and shed a little light on why Wolf Gold was so successful with drawing the attention of reel spinners! Wolf Gold also made the headlines after one player won a tidy $93,632.55 jackpot in 2017 shortly after the title was released. What is even more impressive about this story is the fact that the player had only deposited and played with $78 prior to the colossal win! Yet, thanks to the format of the game, it was only a matter of time before someone got lucky with the mega jackpot!